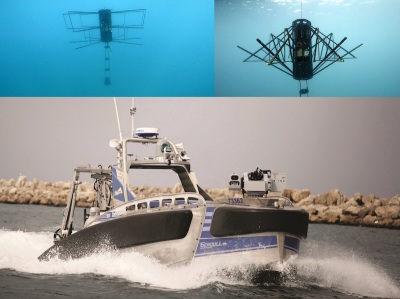 LONDON, UK --- Seagull, Elbit Systems’ multi mission Unmanned Surface Vessel (USV) system, demonstrated live, a remotely operated Anti-Submarine Warfare (ASW) mission. Via Satellite Communication (SATCOM), the Seagull platform, sailing in the Haifa Bay, Israel, performed the operational ASW mission using control consoles situated some 3,515km away in Elbit Systems booth at DSEI Exhibition. Elbit Systems Ltd. is an international defense electronics company engaged in a wide range of programs throughout the world. The Company, which includes Elbit Systems and its subsidiaries, operates in the areas of aerospace, land and naval systems. The Company also focuses on the upgrading of existing military platforms, developing new technologies for defense, homeland security and commercial aviation applications and providing a range of support services, including training and simulation systems.